Last issue, Jace Longenecker wrote the piece “Stop using privilege as a silencer,” for the Perspectives page. Running it posed an ethical dilemma for me as an editor: as a person I didn’t necessarily agree with the piece, but as a journalist, I knew that he has a right to share his opinion. We ran the article, and I anticipated feedback. 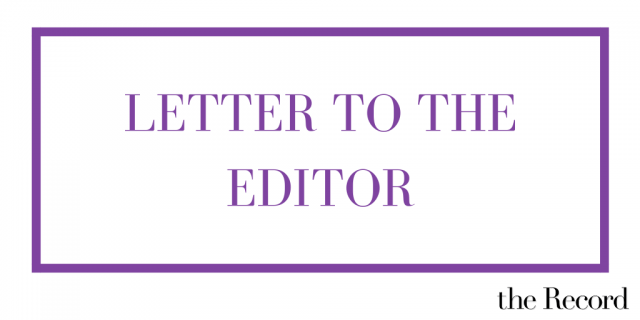 The following letter to the editor was sent by Irene Schmid, a 2016 graduate of Goshen College; I felt it should be shared with our audience. I also gave Jace an opportunity to respond to clarify any misunderstanding. I am a 2016 Goshen College alum. I came across the Record article titled “Stop using privilege as a silencer,” and after reading it felt compelled to write this email. We are in a political time where marginalized people are oppressed and silenced more and more every day. Read the news and you can see how politicians, community leaders, church leaders and others are silencing and marginalizing those who look, think or act differently than expected. When someone is oppressed, and silenced their entire life, sometimes all they are capable of adding to the conversation is “check your privilege.” People are tired of being marginalized and silenced. And more importantly, people are tired of being blamed for calling others out on their privilege and oppression. [“Stop using privilege as a silencer”] is empowering white supremacy, patriarchy, and heteronormativity. It is ironic that it was placed in the perspectives section of the Record’s web page, right next to articles written by people from marginalized communities, such as people of color and people who identify as LGBTQ. Goshen College is better than this. GC claims to be a liberal, accepting community, but continually allows white men to write articles such as these on how being called out on privilege is oppressive. This is violent. This is the opposite of the values that the Anabaptists uphold, the values of community and pacifism. I write this because I cannot not say something. I write this because I care about Goshen and the community. But most importantly, I write this because there are people who have been silenced, and who are deeply affected and hurt by opinion pieces such as these. I hope this will make you reconsider pieces such as these before they are published in the future. My intention with the article was to help readers reflect on the language they use and how that language is perceived by others. As I said in the original piece, I do find the framework of privilege to be a helpful way of analyzing behavior — especially oppressive behavior. I’m thankful for having been introduced to that framework at Goshen, because it has helped me think about the advantages my identity gives me, and how to be more intentional about learning from marginalized voices. I’m encouraged when it helps others do the same. The intention of my article wasn’t to suggest that identities, or the use of a privilege framework to talk about identities, are unimportant. I certainly never claimed to have been oppressed by the language of privilege. In some ways, I wrote the article to address polarization. Regardless of intentions, liberals don’t always articulate their positions well to conservatives, or think about how to effectively converse across boundaries. Liberal people tend to dialogue with liberal people. This is where the potential lies for creating actual change. I think part of an ally’s work could be to learn to have important conversations in ways that don’t immediately alienate conservative people. I agree that Goshen is a fairly liberal place, but I wonder if it’s more important that our community challenge injustice, from wherever that comes, than to be partisan. Asking for the Record to stop publishing articles that represent real dialogue on campus is counter-productive, in much the same way as it is counter-productive to call someone out for their privilege as a means of silencing their voice and removing them from the dialogue they were engaged with. My name is Peter Meyer Reimer– I graduated GC in 2016. I appreciate that you are trying to balance several concerns in publishing this, but given that what Irene is literally saying in this article is that by giving Jace a platform you are enabling the white supremacy and chauvinism that his point of view necessarily entails, why, why why why why why in the world would you give him the last word, and yet another platform for his toxic view? His response is substanceless– you know as well as I do that his /intention/ in writing the article is irrelevant, compared to the /impact/ that the article has on people, on the community, and on the public dialogue. If he wrote an article about how all people who are trans were going to burn in hell with the “intention” of getting more people into heaven, you surely wouldn’t publish that. So why would you publish this, which has a similar chilling effect of dialogue around campus? No matter how good Jace’s intentions may have been, this article does not give more voice to anyone around campus– it keeps people with marginalized identities more silent, since they realize that their concerns won’t possibly be taken seriously by whitebois like Jace. Kristin, I hope that, if nothing else comes of this process, you reexamine what it means to be a journalist, and what it is okay or is not okay to give a platform to.